The great thing about sports is that there’s always something happening, whether it be a huge signing, a trade, a top draft pick, an injury or key milestone. And that’s why we’re dedicated to keeping each of our users on top of all the latest news as it happens with theScore’s breaking news alerts. Currently available for NFL, NBA, NHL and MLB – with more league coverage on the horizon – our breaking news alerts are available on iOS and Android. We now have more than one million users subscribed to at least one league’s breaking news alerts, and we fully expect that number to keep on growing. 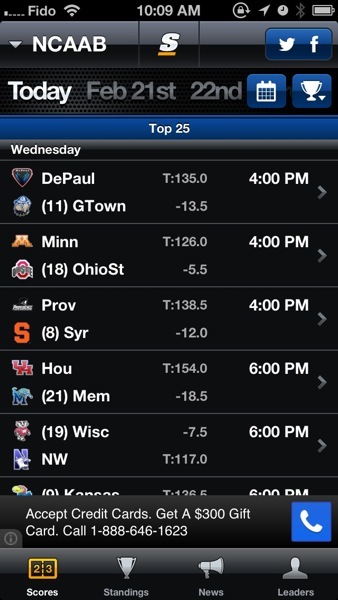 TheScore Mobile has been updated today to include complete coverage of the 2013 NCAA March Madness College Basketball tournament. The update includes a new March Madness bracket view for the tournament, which allows users to scroll and pinch and zoom for views. Also, push alerts are now available for “Final Scores” for the end of each game and “Upset Tracker” alerts, for when a lower ranked team is leading a higher ranked team at halftime, 5 minutes left in the game or at the end of the game. If you’re following the tournament with money on the line, this update is going to make your life better or possibly worse. March Madness 2013 starts on Tuesday, March 19th and ends on Monday, April 8th. 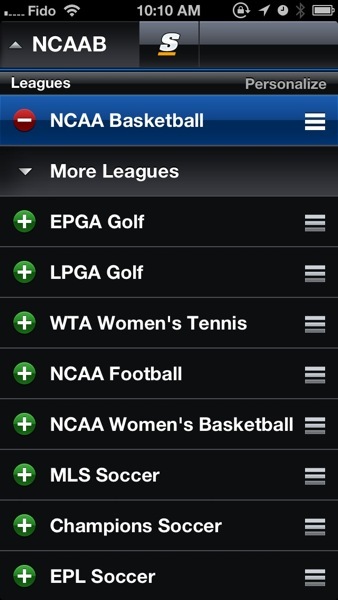 For all the sports fans out there theScore Mobile has received a decent update today to include full coverage of upcoming ‘March Madness’ from the NCAA College Basketball tournament, breaking news push alerts for your favourite leagues (NHL, NBA, NFL and MLB), easier customization of league ordering, and more. Not much to say here other than to download this if you love sports. • NCAA College Basketball Tournament – full coverage of draw and all games. Turn on Upset Tracker alerts to be notified in real time of any potential upsets! The All Games alert will notify you at the end of every tournament game with the final score. • Breaking News push alerts for your favorite leagues – We’ve now got breaking news alerts for the biggest trades, injuries and happenings – for NHL, NBA, NFL and MLB. Turn them on when you go into the “News” section for each league. You can turn them off easily in the settings area. • Customize your league ordering even easier on iPhone – click “More Leagues” and tap the plus / minus buttons. • Proper team calendar names for full seasons. • Optimizations to team alerts. Note: If you want to make any changes to your alerts you can customize all alerts under settings now. • Full coverage of NBA Trade Deadline in the Scores and News sections. Live Feb 18th. Back in October, ScoreMedia was acquired by Rogers, with the latter also having a 10% stake into ScoreDigital, the maker of theScore. Click here to download theScore for iOS, it’s free and also a universal app.